Welcome back to another weekly update of the new cards for Cardfight!! Vanguard. A good amount of G-BT07 has been revealed in the last seven days. And this Sutherland has been upgraded to a Grade 3 as the new, Dragon Fang Chain-bullet, Sutherland. All his effects work on the VC and RC and he makes a for a nice little back-up Grade 3 for Blademaster. Firstly he has the Blaze keyword, and if your Vanguard is Blazing and you have Follower Dragon Maid, Reas in the same column as him, he gets +4000 power, making the column 21k. As well as all of that, he has a final skill with the cost of Counter Blasting one if a unit was placed in the same column as him to retire one of your opponent’s rear-guards who also shares the same column as him. Now the ruling will allow you to use the retiring skill if he is your Vanguard and you stride over him, but then you only really have one target you can choose. He would be much better on a rear-guard circle where you can call Reas behind him to activate Sutherland’s retire skill, then put Reas back into your hand and repeat again next turn. 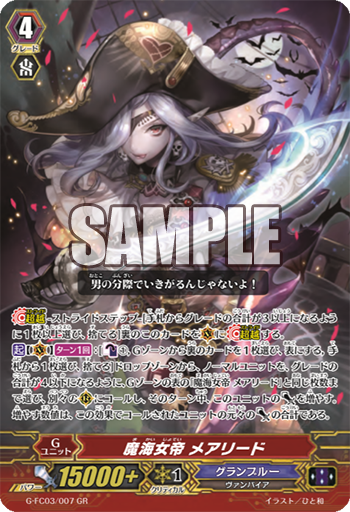 I do like return of these characters despite the Legend deck having already happened and with the all this retiring that Kagero are capable of these days, maybe the old Sutherland could find some use in newer decks. Kagero’s Glimmer Breath clone with Radiant Dragon. 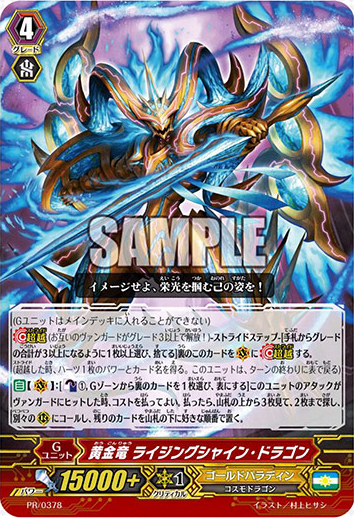 With a GB1, CB1, and SB1 when this unit is placed on the RC, if you have a Vanguard with Dragonic Blademaster in its name, you can choose one of your opponent’s Grade 1 or less rear-guards and Radiant Dragon gains +2000 power until the end of the turn, as well as +2000 power for each of your opponent’s open rear-guard circles if your Vanguard is Blazing. So at best you are looking at a retire and a 21000 attacker for a turn. This is made a lot easier against Magia, Hollow, and Great Nature which Kagero previously had a problem with but now they can make advantage of everything hiding away, though don’t expect big numbers when going against highly resist-based decks like Aqua Force and Neo Nectar. Though with his power up for the open RCs being a CONT ability he can gain more power while in the battle phase, this brings more use and more pressure to Irresist Dragon. 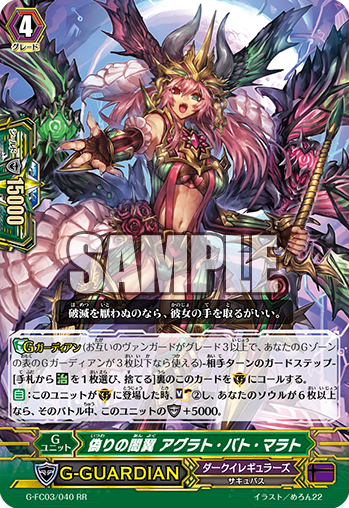 You get a smaller choice on what to retire than Twilight Arrow Dragon, but like Irresist, Twilight Arrow and Radiant Dragon can work together to gain more power. His effect seems a little Narukami-esk but I think it’s the boost Blademaster needed to help him on the road to stealing popularity from Dragonic Overlord. A very good Grade 1 unit for Dragonic Blademaster is Dragon Knight, Nadel. He has the Blaze keyword as well as an effect that works on the RC. 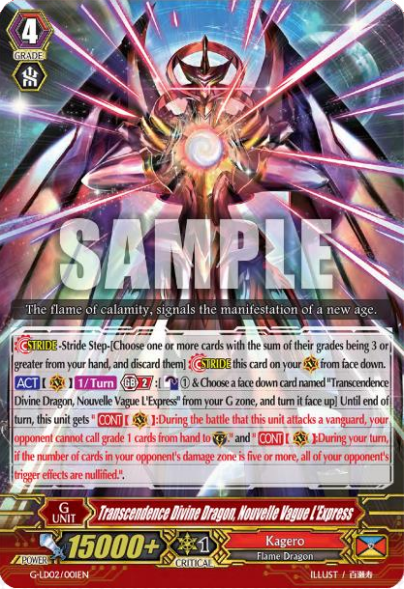 If your Vanguard is Blazing, once per turn, when one of your opponent’s rear-guards are retired from one of your card effects and you have a Dragonic Blademaster Vanguard, you may Counter Charge 1 and Nadel gains +4000 power. This suddenly makes a few retiring skills free like Dragonic Blademaster’s and Twilight Arrow Dragon’s. If your opponent has no rear-guards then you can make a column of 32k with Radiant Dragon and Nadel. He doesn’t have a GB but considering you need a Dragonic Blademaster Vanguard and a lot of the retire skills are GB1 anyway, then it doesn’t make much of a difference. 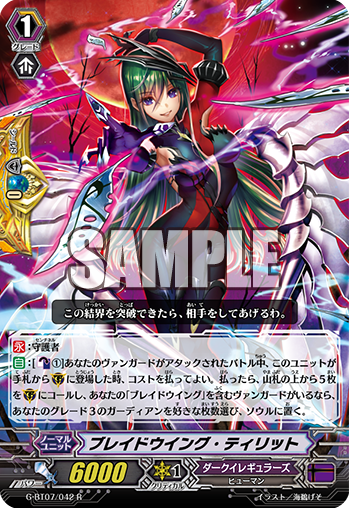 A great boost to Dark Irregulars comes in the form of Serpent Charmer. When he is in Darkness, if you have ten or more cards in your soul then he gains +2000 power, making him a 9k booster. Then if the number of cards in your soul is fifteen or more he gains the ability where at the end of the turn you may retire him, if you do, you choose thirteen cards in your soul and put any other cards in your soul back into your deck and shuffle. A lot of people will be happy that they can now put all there triggers that were not wanted in the soul back into the deck, as well as perfect guards or maybe even Grade 2s if your field is looking a little weak. If you use Scharhrot Vampir then the turn after you will have no trouble getting yourself back up to fifteen cards in soul with his on-stride skill. Serpent Charmer will be used more for Scharhrot decks more than others but he can be useful in Amon too, though usually Amon will try to get as many cards in his soul as possible, but if you are about to run out of deck then this guy can really help you out. 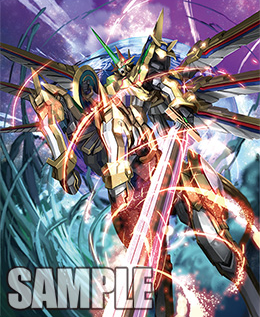 However, he won’t be needed in a Blade Wing deck as they have Blade Wing Tibold. Three-in the Dark is an 8000 power Grade 2 with Darkness and GB1. When she attacks and if you have ten or more cards in your soul you may discard a card to draw two cards and put one card from your hand into your soul. Then if the number of cards in your soul is fifteen or more she gains 5000 power. I really wish the cost of the effect was to put a card in your soul rather than discarding it but after when you can choose something to put in your soul you could always select something like Dimension Creeper. I think most people who want a similar effect to Three-in will stick with Flying Librarian as she works a lot earlier and you aren’t discarding anything. Flying Librarian doesn’t get the power boost but you can always just intercept with her and have something like Doppel Vampir or Squallmaker Vampir out afterwards. Nighttime Gentleman, Saint-Germain is a G Guardian for Dark Irregulars. When he is placed on the guardian circle, if you have ten or more cards in your soul, he gains +10000 shield. Then, if you have fifteen or more cards in your soul, you can choose any number of your units and give them resist. So already he’s looking like a better version of Dizmel as the Resist can be applied to him as well but it does take a longer set-up. The reason it gives you the choice to give resist to your units or not is in case you are up against something like Phantom Blaster “Diablo”, but for that to be a problem you would have to G Guard one of their rear-guards which you would probably want to wait for when their Vanguard attacks. Using Agrat Bat Mahlat along side this card would be wise as Mahlat would be able to Soul Charge early on, then later in the game you can go into Germain. Gear Chronicle get a new Quintet Wall with Steam Scalar, Emellanna. She has the standard QW skill as well as when she is put in the drop zone from the guardian circle you may bind one card from your drop zone face up and choose two cards from your drop zone and return them to your deck. The bind itself can give you field advantage with Mudal and Parallel Dragon. The increase of cards in your bind zone will also help you with Bind Time Dragon’s skills. If you run this with the perfect guard then you can put the perfect guard back into the deck after using this card, and as it doesn’t specify a type of unit, you can also put triggers back. One card that was revealed in the anime was Golden Beast, Sleimy Flare, a new G Guardian for Gold Paladin. From what we can gather from the skill, the cost is only to put one of your rear-guards on the bottom of your deck, then look at the top five cards of your deck and choose up to two units with two different grades and call them to the guardian circle. With looking at the top five there’s a fairly good chance of getting a perfect guard, though if you are not using the standard perfect guards then they will be a little useless. Other than that, it quite easy to get a 30000 shield with a Grade 0 that isn’t a draw, and a Grade 1 or 2. The cost doesn’t hurt it too much as you will be able to easily call more rear-guards next turn and at least it doesn’t eat away at your Counter Blasts (From what we know). Angel Feather and Dark Irregulars both get their Heart Thump Worker clone. Black Spark, Munkar works with Gavrail and One-eyed Succubus works with Scharhrot. As it is with Heart Thump Worker clones, when your Vanguard with the specified name attacks, you can put this unit into your soul and your Vanguard gains +5000 power and you draw a card. One-eyed Succubus is a lot more useful as Dark Irregulars work a lot more with the soul, but Munkar should find plenty of use too. Welcome back to another weekly update of the new cards for Cardfight!! Vanguard. 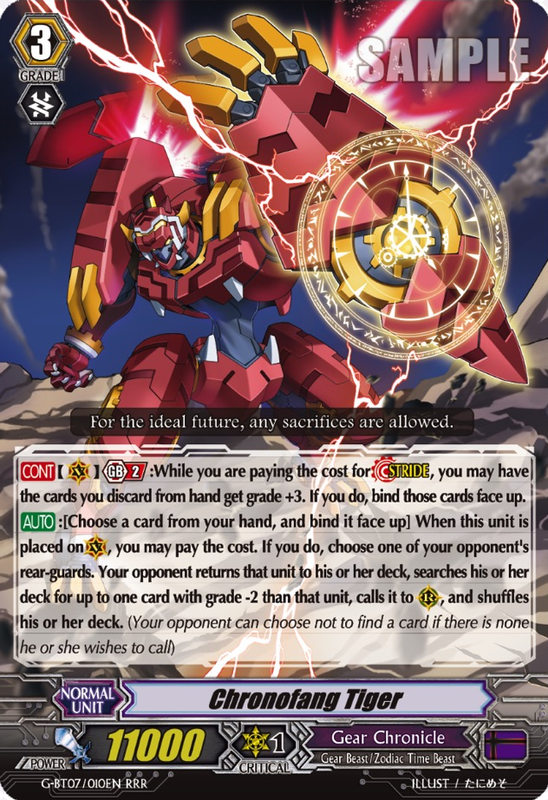 Monthly Bushiroad gave us a huge amount of cards to look forward to for G-BT07 so I will try to get through every one of these as well as the cards of the week which all give us a nice idea of what to expect from the next set. One that I know a lot of people have been looking forward too because it will create a new build for Gear Chronicle is Chronofang Tiger. Chronofang isn’t a strider as some people would have assumed, though he does have a GB2 skill that gives any card in your hand Grade +3 when you are using them as stride fuel, then the cards you used to stride with are sent to your bind zone instead of the drop zone. As well as this, he also has an on-ride skill where you put one card from your hand into the bind zone, then you choose one of your opponent’s rear-guards, they put it into their deck and search for up to one card with 2 less Grades than the unit put into the deck. Seeing as there is a lot of permanent binding of your cards, and although we do get some cards that can work from the bind zone, I would recommend using draw triggers in a Chronofang deck to counter the loss of cards. Bind Time‘s skill has been officially revealed. He gets the extra 10k and a crit when attacking if you bind one of your units, and your opponent puts one of their units on the bottom of their deck for each card in your bind zone. Though the full skill does require a Counter Blast 2, Soul Blast 1, and a G Persona Blast but if you have a Gear Beast (race) heart then you also Counter Charge 2 and Soul Charge 2. The extra Soul Charge can help you out with rear-guard skills for units such as Steam Fighter, Mesh-he; Steam Scara, Gigi; and Steam Knight, Mudal. 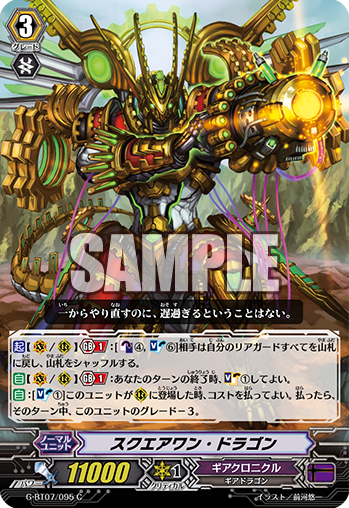 Parallel Barrel Dragon is a Grade 1 Gear Chronicle who’s skill works from the bind zone. You can choose one of your rear-guards to rest and if you do you can call this unit to open rear-guard circle. Your target for the rest could be something you know you will be Time Leaping later that turn making it less of a burden on your part. This card and Mudal make Chronofang’s and Bind Time’s costs less of a disadvantage. A fairly decent early game Grade 2 is Safety Observing Gear Diver. Though he only has 8000 power, he has a skill with the cost of resting himself and binding a card from your drop zone you can put one of your opponent’s rest rear-guards at the bottom of their deck and Gear Diver cannot stand during its next stand phase. Even with its low power and with it paralysing iteself, getting rid of one of your opponent’s attackers and binding one of your drop zone units is a pretty big buff, especially with Mudal and Parallel Barrel who can come back, and Bind Time who can use your bind zone against your opponent. Lastly for Gear Chronicle we have Tooth Edge Dracokid, a new forerunner without Generation Break. As an ACT you can put him into the soul and discard a normal unit from your hand, if you do you can look at the top card of the deck, decide to put it on the top or the bottom of your deck, and then draw a card, and give one of your units +5000 power. He could be useful if you are lacking a grade in your hand to help you ride all the way to Grade 3 but people may not use him for the fact that he only has 4000 power, though you probably won’t be using him to boost for long in a match. Next up is a clan we haven’t seen for a while, Dimension Police. First it would be best to go over this clan’s exclusive keyword which is called “Burst”. Burst activates when your Vanguard has reached a certain amount of power, allowing you to unlock even more potential. Rear-guards can also have Burst, which allows them to bounce off your Vanguard’s power. To start off big I’ll go over their RRR stride, Super Cosmic Hero, X-gallop. When X-gallop attacks, if he has 35000 or more power, his Burst effect activates which allows you to Counter Blast 1 and G blast at Generation Break 2 to gain +1 drive check making him a quadruple drive. Then, if his power is 40000 or greater, all your rear-guards in the front row gain +4000 power for each face-up Super Cosmic Hero, X-gallop in your G zone. Getting him to 35000 power is very easy to achieve if you have a simple 5000 power or greater unit boosting him and giving a +4000 power boost from an effect of one of your units. Getting him to the 40000 will be a little trickier if you are using your forerunner to boost him, however if you were to put a 6000 power or higher booster behind him you would only need to use two power giving skill on him. For just a CB1 and G blast this card is crazy, especially considering you can use him four times. He is not Gallop restricted so I would highly recommend putting him in any power-giving deck (Aka anything that isn’t Zeal). As for forerunners, you shouldn’t have any trouble replacing this new one for a Grade 1 later in the game as he does go into the soul. Cosmic Hero, Grandhop has a GB1 Burst skill where you can rest him to give your Vanguard +4000 power if your Vanguard has 25000 or more power. If your Vanguard’s power is then 30000 or more, you can put Grandhop into the soul, draw a card, and Counter Charge 1. This is a fairly useful skill as Dimension Police in general don’t have very many Counter Chargers and there are a few cards that only get their skills on-call so the draw will help there too. It could be wise to not put this unit behind your Vanguard and instead put him below a high-powered rear-guard and rest him every turn. A very useful Grade 2 that Dimension Police are getting in this set is Cosmic Hero, Grandrevolver. He has a once per turn Burst ACT where you may Counter Blast 1 if your Vanguard has 15000 or more power to give one of your rear-guards +4000 power. Then, if your Vanguard has 30000 or more power Grandrevolver will Counter Charge 2 if his attack hits. He really only Counter Charges 1 as the skill itself Counter Blasts 1 but you can choose the unit behind this one to gain the extra power so this unit has a better chance of hitting, or if you had two of this card on the field you could have them give each other power so they both have a better chance of Counter Charging, and if only one hits then at least you didn’t really have to spend any Counter Blasts on the two skill. On top of all of this he has Resist which will prevent him from being targeted by retires and locks. Great Cosmic Hero, Grandmantle is a very useful backup Grade 3 for Gallop. When he is placed on the Vanguard circle you may Counter Blast 1 and Soul Blast 1 to search the top five cards of your deck for a unit with the Burst ability and add it to your hand. What really makes him good though is his second skill: As a Burst ACT you may Counter Blast 1 and if your Vanguard have 15000 power or greater then this unit gains +4000 power and if your Vanguard has 35000 power or greater, this unit then gives your Vanguard an additional 4000 power. You can only use the second skill once per turn but it does help you reach that glorious 40000 power for X-gallop and let’s not forget the 45000 power needed for X-tiger. Our inevitable Burst perfect guard is Cosmic Hero, Grandreef. His non-nullifying skill is a once per turn Soul Blast that you can use if your Vanguard is at 30000 or more power and if you do, you can return Grandreef back to your hand at the end of the turn. Then if your Vanguard has 35000 or more power, Grandreef gains +4000 power. I think this is definitely one of the best of the keyword perfect guards as soul isn’t used overly much in Dimension Police and becoming a 10k booster/attack is always nice. Lastly for Dimension Police we have poor ol’ Enigmans struggling along. This one is a stride, and like the G Guardian, it doesn’t really help Enigmans. Superlight Giant, Enigman Cross Ray has a fairly simple skill, at the beginning of your attack step (so before boosting) if this unit has 30000 or more power you may rest one of your rear-guards and he gains +10000 power. I guess this is used to help with Burst effects but as the Burst skills of rear-guards so far have happened in the main phase, I don’t see how this unit helps much. I guess if your opponent doesn’t have any perfect guards they are going to struggle against this card though. Kagero get an almost Steam Fighter, Balih clone for Overlords. 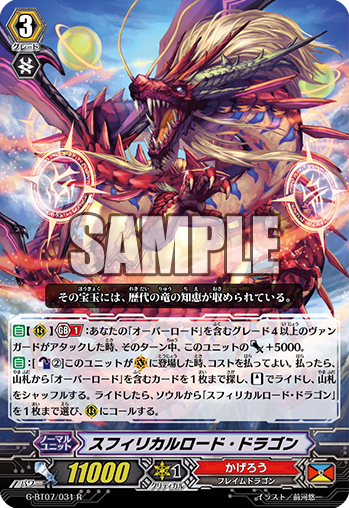 When this Spherical Lord Dragon is placed on the Vanguard circle you can Counter Blast 2 to search your deck for an Overlord and ride it as stand. Then you can choose this card from the soul and bring it out to a rear-guard circle. His other skill works on the rear-guard circle and when your Grade 4 with Overlord in its name attacks, this unit gains +5000 power. So he becomes a nice little 16k attacker but the Counter Blast 2 for his ride skill may seem a bit costly for Kagero and you’re probably better off just running more Overlords, though he does make for a nice budget option. Another Kagero Grade 3 is Wyvern Strike, Garugy. He has the Blaze keyword and if he on the Vanguard circle while Blazing then he gains +3000 power until the end of turn, and when he is placed on the Vanguard circle you can CB1 and SB1 to search the top five cards for a unit with Blaze and put it into your hand. He’s not very strong and I feel that Heroic Saga Dragon fills the back-up Grade 3 slot better as I feel they are both there to be the backup of Dragonic Blademaster but I would definitely go with Heroic Saga instead. A good little trigger that Kagero got is that Stand trigger, Inspire Yell Dragon. As well as having the Blaze keyword he also has a Generation Break skill. With the cost of putting him on the bottom of the deck if your Vanguard is Blazing, you draw a card and give one of your units +5000 power, then shuffle your deck. He seems to work the best in a Dragonic Blademaster deck but as he is a nice little power up as well as a draw and stand in one then he could be fit into a few other decks. Dragon Knight, Roya is a defensive Grade 1 unit much like Balloon Raccoon. With the Blaze keyword he is also given two skills, one of which allows you to put him in the bind zone after he attacks or boosts. Then with a GB1 skill when he’s in the bind zone, you can put him into the Guardian circle at the beginning of a guard phase and he gains +5000 shield. His power is only 6000 but seeing as he’s more of a defensive unit I’m sure he will still be used in a few decks. Also if you are up against Narukami you can use their binds to your advantage. Then Dragon Knight, Nadim is our last Kagero unit this week who yet again has Blaze. When this Grade 2 attacks a Vanguard, and if your Vanguard is Blazing, he gains +2000 power, then if you are on GB1 and his attack hits you can Counter Charge 1. He’s a pretty nice card for a clan that uses a lot of Counter Blasts and I can see him being used in many Kagero decks. 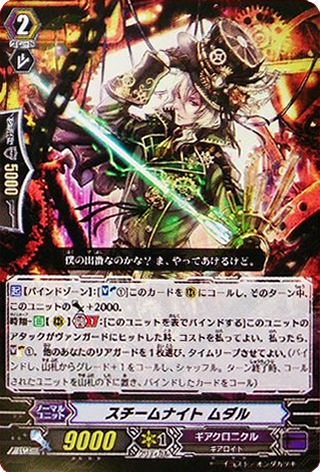 Dark Irregulars get some pretty strong cards, the first one being a Grade 2 called Doppel Vampir. 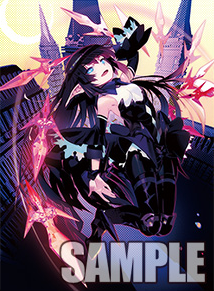 At Generation Break 1 and if Doppel is in Darkness (Darkness is the new keyword for Dark Irregulars. It takes effect when a card has been put into the soul during that turn) this unit will gain 5000 power when attacking if you have six or more cards in the soul. Then, if you have fifteen or more cards in the soul, your opponent won’t be able to guard with Grade 0s, making him a very strong Silent Tom. These are pretty easy to achieve, especially with Blade Wing Tibold who can Soul Charge 5 on your first stride and prevent you from decking out. Enigmatic Assassin is a new Grade 0 with 5000 power but lacks the Forerunner keyword. She has a Darkness skill that works from the soul which you can activate at the beginning of your attack step. This skill allows you to bring her out onto the field from the soul if you have ten or more cards in the soul and she then gains +5000 power. Then if you have fifteen cards in your soul she gains an additional +10000 power, making her a 20000 attacker or booster. She is a very strong unit, however her power up only lasts until the end of the turn, though luckily you can use her with the original Amon to put her back into the soul and then bring her right back out again. 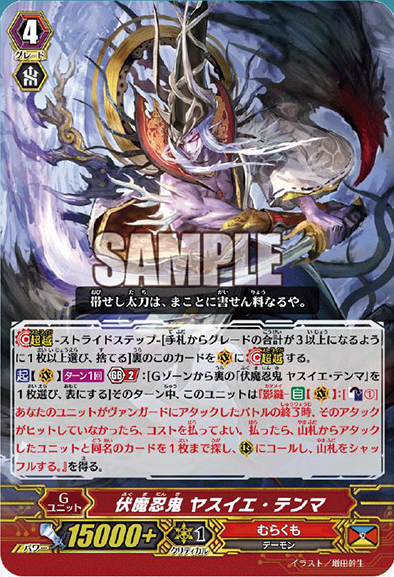 A very useful stride that Dark Irregulars are getting is Mask of Demonic Insanity, Elikries. When he’s in Darkness and he attacks, you Soul Charge 2. Then, if you have six or more cards in your soul when his attack hits, your opponent much choose one of their rear-guards and retire it, and if you have fifteen or more cards in your soul, he gains +1000 power for every card in his soul until the end of that battle. Being able to Soul Charge on-attack is very useful. The main problem with Kisskill was that she would only Soul Charge when the attack hit, and although the draw was nice, Elikries helps a lot more with the set up. Frosty Steeple is a good back-up Grade 3 for Scharhrot Vampir. He has the fairly common effect of Soul Blasting and Counter Blasting 1 when you ride him to look at the top five cards of the deck in search of one card with the clan’s unique keyword, this one looking for one with Darkness. His other skill is a lot more useful though. When he’s on the Vanguard circle and if he is in Darkness and you are at Generation Break 1, he gains +10000 power when he attacks if you have ten or more cards in your soul, and if you have fifteen or more cards in the soul he prevents your opponent from guarding with Grade 1 or higher units from their hand, making him similar to a Grade 3 version of Gilles de Rais. I would definitely use this guy as a back-up for Scharhrot as they can work together pretty well if you set up with Scharhrot first and then use this guy in the late game. 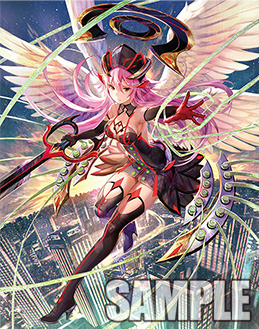 Nine Break Hustler is the last of the Dark Irregulars with her being another Grade 3 but this time only having 10000 power, yet has a useful skill, similar to the Blade Wing Grade 3s. If you call her to a rear-guard circle at Generation Break 1 you can choose up to two of your units and search for up to three copies of each of them and put those copies into your soul, then she gains +1000 power for each card put into the soul this way until the end of the turn. This is a fairly useful card and can put Dimension Creepers into your soul easily, as well as cards from the Witching Hour series. 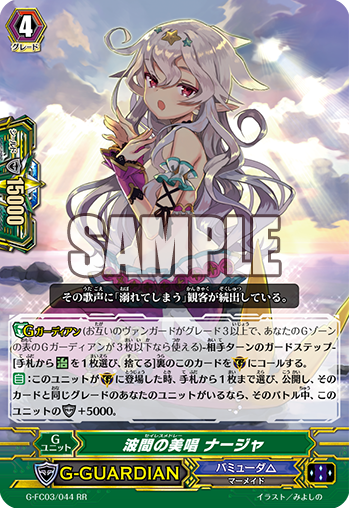 I’m not sure if she is going to be able to find a place in many Dark Irregular decks but you may choose her as your back-up Grade 3 for Scharhrot if Frosty Steeple isn’t your thing. She could also work in Amon though the Grade 3 spaces are usually taken up by both of the Amons and Astaroth. Knight of Blooming Sun, Jeffry is a fairly simple but very useful card for Gurguit decks. He’s not Gurguit restricted but he has Unite and Generation Break 1 which gives him the ability to go into the soul at the end of the battle that he boosted to draw a card. Jeffry and Marcia give so much fuel for Gurguit to work with and Jeffry just adds to the defence. Another Unite unit comes in the form of the Grade 3, Knight of Merciful Light, Bradott. As a once per turn Unite ACT you can Soul Blast 1 to reveal the top card of your deck, then Bradott gains power equal to the power of the revealed card. If the revealed card then has Unite you can call it to an open rear-guard circle. If you go first in the match, this will help you during your first ride as he isn’t slowed down by a Generation Break but he isn’t extremely useful. At least if you superior call Jeffry with his skill it kind of turns into a free draw. Bururugal is a little Grade 2 powerhouse for Golds. When Bururugal attacks a Vanguard, if he is United then he gains +5000 power until the end of the battle. He’s a nice attacker and I’d recommend running a couple at least as you can get to some pretty high numbers with this card. 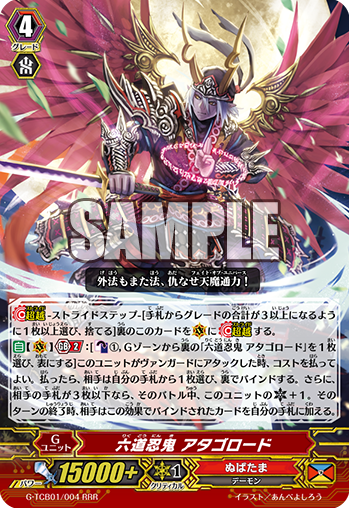 One card I’m very interested in is a Grade 2 from Angel Feather, Drive Celestial, Armaiti. He’s normally only at 8000 power but if you have a card in your damage zone with the same name as a card on your Vanguard circle AND you have no rear-guards in your front row, he gains +8000 power and can attack on the back row. As long as you don’t mind not boosting your Vanguard then this card will allow you to attack four times without any abilities standing your rear-guards. You could use him with Ramiel “Reverse“ because if you lock the front row rear-guards then they technically aren’t there and Armaiti still gets his buff. Angel Feather also get a new keyword named “Rescue”. Rescue used when a skill involves healing one of the cards from your damage zone and taking the top card of your deck and putting it into the damage zone. What makes Rescue useful is triggers are active during this damage so you can still get extra benefits by getting Criticals, Heals, Draws, and Stands during Rescue. To give you an idea of how this works in a skill we have Treatment Nurse. Her skill is shown with a “Rescue-1” at the beginning of it, indicating that one day we will get cards that can rescue more than one, and if Treatment Nurse’s attack hits at a Generation Break 1 you can heal a card and damage yourself. You’d mainly want to damage yourself during the main phase as that’s when you will be able to give the power ups from the Rescuing but at least if you get a Stand trigger you can stand her right back up again. 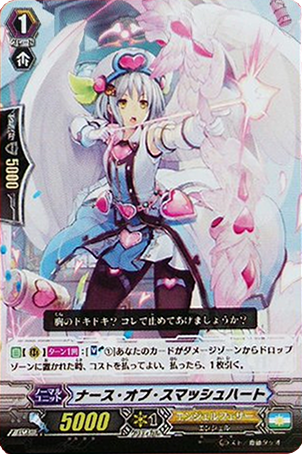 Requiem Pegasus is a Grade 3 who has the same effect but also gives another units +2000. Healing Palace is probably a better Grade 3 back-up but if you’re going for a heavily Rescue deck then Requiem Pegasus is the way forward. Doctoroid Remunon is a new Perfect Guard that activates its second skill if you have another copy of her face up in the damage zone, and if you do you can Rescue one card. It would be pretty good to put this in a Nociel deck and you can often switch cards from your hand with cards in your damage zone, making it so you can prepare for this card’s effect and then get it back into your hand when you’re in a pinch. Angel Feather also get a new Forerunner. Black Report, Ridwan has a Generation Break skill that you can activate when a card is put from your damage zone into the drop zone. If this does happen then you can put Ridwan into the soul and choose one of your rear-guards and give it +4000 power. Then if that card was put into the drop zone by a Rescue ability, you may call that Rescued unit to a rear-guard circle. This a pretty nice superior caller and is a good way to promote the new keyword. Black Candle, Azrail may still seem like a good choice for some decks but Ridwan does not require a Counter Blast. As well as all of this, Bushi also revealed all the box topper promos that we are getting in G-BT07. There are a few reprints such as Coolgal; Medical Bomber Nurse; Dragonic Burnout; and Thunderbolt Shockwave Colossus. However, there are also two new cards! The first one is for Dimension Police, Cosmic Hero, Grandlady. She is a 7000 power Grade 1 and when she is on a rear-guard circle you can rest her as an ACT to give your Vanguard +4000 power. Then if your Vanguard has the Burst keyword you can choose one of your rear-guards and give that +4000 power too. She’s very nice if you want to save on Counter Blasts and you are not losing too much power if you have strode X-Gallop as you will still be able to give power to a rear-guard she may be behind. 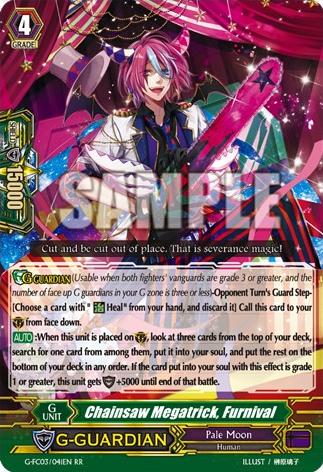 Dark Irregulars’s box topper is Eccentric Dissector. He is an extremely useful card, especially for the new Darkness keyword. At the beginning of your main phase he allows you to Soul Charge 1. You don’t have to if you don’t need it which helps you a little with decking out purposes but if you had more than one of the rear-guard circle it would definitely help you reach your soul goal. 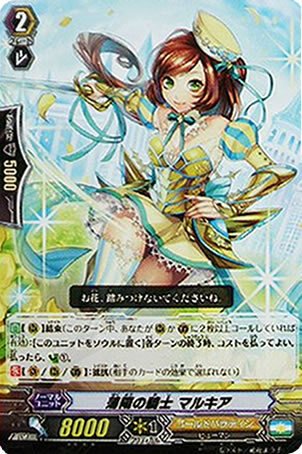 And last but not least we have one card from the next Bermuda Triangle clan booster, Garland Blossom, Ayna. She has Harmony and a Generation Break 1 skill that gives all units in the same row as her Harmony if she is in Harmony. Then, as a non-Generation Break ACT you may Counter Blast 1 and rest her to give all units in the same column as her +5000 power. This does mean that she will also get the +5000 power but until we see the rest of the cards in the set it will be hard to say whether it will be easy to stand her back up or not. Welcome back to another weekly update of the new cards for Cardfight!! Vanguard. All the G Guardians have finally been spoiled and I will go over all of the remaining cards for Fighter’s Collection. 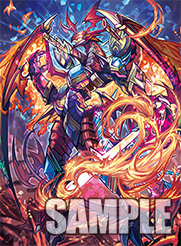 As well as that, some awesome G-BT07 cards have been revealed and I will go over those too! 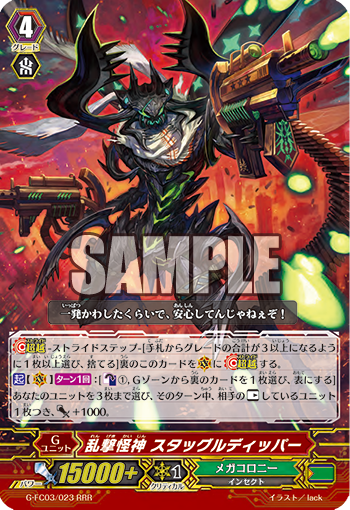 First in the spotlight is Pale Moon’s Chainsaw Megatrick, Furnival. 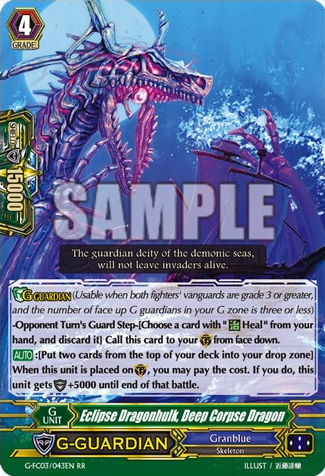 When this G Guardian is placed on the guardian circle you look at the top three cards of your deck and put one of them into your soul and put the other two cards at the bottom of your deck in any order. If the card put in your soul was a Grade 1 or higher, Furnival gains his +5000 shield. This is probably one of the best G Guardians in the set as it helps with any Pale Moon deck and I doubt there will be many times when you look at the top three and they’re all Grade 0s. Spike Brother’s get a fairly simple yet effective card with Excellent Cheer Leader, Ailie. When you have three or less rear-guards Ailie gets the +5000 shield. This is a very easy condition to meet with the new Charge keyword as your rear-guards would go to the bottom of the deck anyway. 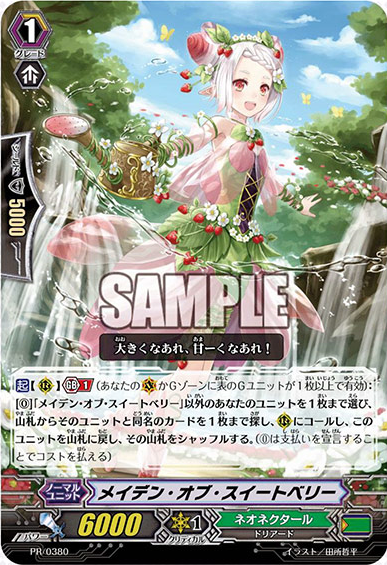 Guardian General of Heavenly Water, Philothea gets +5000 shield when she blocks if it is on the first or second wave of your opponent’s turn. 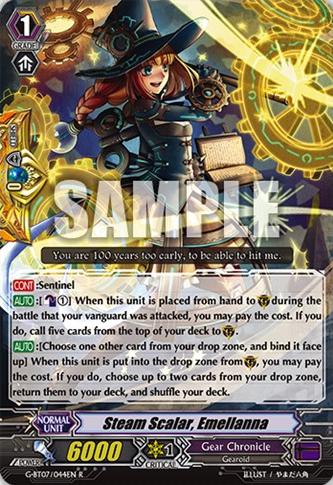 If your opponent relies on stand triggers and having their Vanguard attack last then this G Guardian will fall short but most decks these days tend to run eight to twelve critical triggers so her extra shield will probably work more times than not. Granblue’s Eclipse Dragonhulk, Deep Corpse Dragon will have you drop the top two cards of your deck to gain a +5000 shield. This, like the Pale Moon G Guardian, is very helpful in any build for their deck. It is probably best not to use it too much as it can result in decking out but this can work very well in a Seven Seas deck as they are more reliant on random drops rather than more specific ones that the G decks are good at. Lastly for the G Guardians is Dream Mutant Deity, Scarabegasus for Megacolony. His extra shield activates when your opponent has two or more rested units. 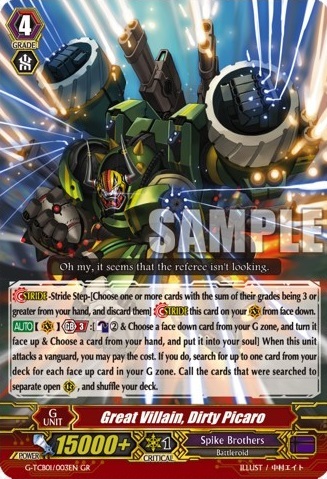 If your opponent can get around this by not boosting their attacker though if you’re against Shadow Paladin, Tachikaze or Homura Raider then you may find that you can’t guard to his full might because your opponent won’t have many units of the rear-guard anyway. As with many Megacolony cards, it’s very situational depending on what deck you are up against but at least we still have the Cray Elementals if everything else goes wrong. Overall, I think these G Guardians are a great idea seeing as the power was getting so high from strides, so this will help balance out the power as well as hopefully giving you longer and more enjoyable games. Now, onto something a bit different. As we have been given the new perfect guards with newer abilities, it’s only natural that we would also be given quintet walls with new abilities too. 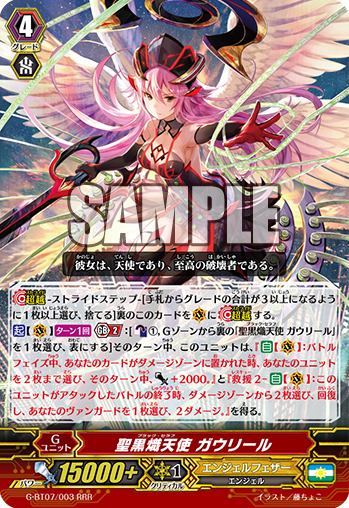 Blade Wing Tilith is one of these new quintet walls that works how you would imagine with a CB1 to call the top five cards of your deck but along with that skill you can also choose as many Grade 3 cards with “Blade Wing” in their name from the guarding cards and put them into your soul. This ability is mostly useful for putting Blade Wing Reijy and Wings of Reincarnation, Blade Wing Reijy into your soul but thanks to Blade Wing Sullivan, every guardian you have gains +10000 shield so the smallest possible shield you can get from a QW is 60000 because the QW itself will receive the extra shield. This will help you tremendously against Legendary Dimensional Robo, Daikaiser Leon and other cards that mess with your guardians. I would imagine you would max this at one or two in your deck as Dark Irregulars struggle with the whole decking out business. At least Tibold helps you out with that, still probably best not to run four copies of her though for the sake of your Counter Blasts too. We’ve seen one other QW so far and that one is for Gold Paladin. Holy Mage, Irena seems to have been specifically designed around Gurguit but may help with future Gold Paladins. As well as the usual QW skill, she has a separate skill that activates when placed on the guardian circle from the deck. When that condition is met you can discard a card from your hand and put into your hand and put the top card of your deck onto the guardian circle and give it +5000 shield. Unless Gold Paladins get some seriously good counter chargers I would recommend using the original perfect guards for Gurguits skill, but what we’ve seen from Macia, good Counter Chargers are very likely. Gold Paladin also get a useful Grade 2 with Knight of Spring Light, Bellimor. He has a Unite skill that gives him +2000 power which can work on your turn as well as your opponent’s turn. As well as that, he has an on-call skill with a GB1 and CB1 that has you look at the top three cards of your deck to choose one and place it on a rear-guard circle in the same column as himself, and put the other two on the bottom of your deck. Only being able to call it to the same column is a pretty annoying restriction but this is what Dawngal was made for and there’s a good chance that the new Gurguit will help with this problem like giving all rear-guards a power boost when a card is placed from the deck or maybe giving all back-row units the ‘Boost’ ability. There was one new card that we got a pretty good idea of the skill from the anime. The card is Interdimensional Dragon, Bind Time Dragon and it was a stride that the main antagonist used. From what people can gather it has a GB2 that activates when he attacks by binding one of your rear-guards (Not Time Leap) and he gains +10000 power and +1 critical. As well as that, your opponent then chooses one of their rear-guards to put at the bottom of the deck for every card in your bind zone. This seems like a very strong ability for the cost so I’m going to assume there is at least a Counter Blast involved though we won’t really know until we see it in the official spoilers. Other than all of that we have two little promos. One is quite interesting as it has the same treatment as Nega-keiopojisis and Avectro Zeus where its original art designed by a fan. 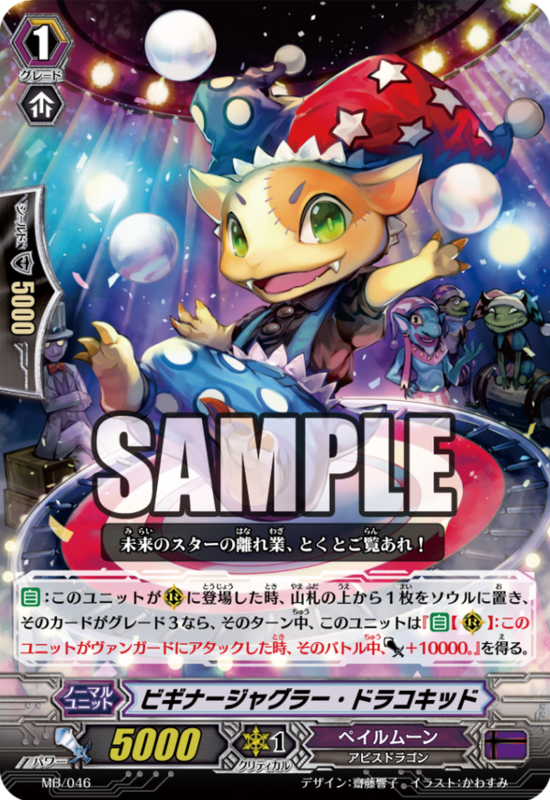 This card being a Grade 1 Pale Moon unit named Beginner Juggler Dracokid. He only has 5000 power but when he is called to RC you Soul Charge 1, and if that card was a Grade 3, Juggler Dracokid gains +10000 power when attacking during that turn. He’s a very niche card but even if you are not relying on him getting the power, he still turns into a nice Soul Charger. 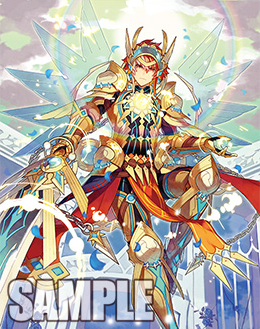 The other promo is a Grade 2 Gold Paladin, Knight of Slanting Radiant, Ledion. When this card enters Unite you can activate his ACT ability by Counter Blasting 1 for him to gain +3000 power; making him a 12000 attacker. It’s not a very exciting or strong card but at least it’s only a promo. We have no news of whether we will be getting these in English or not but, although he is niche, I would like to see people use Juggler Dracokid in the future. Welcome back to another weekly update of the new cards for Cardfight!! Vanguard. The Fighter’s Collection 2016 cards are almost at an end and we only have five G Guardians to have revealed to us after today. We have also had a trickle of G-BT07 Gold Paladin units units spoiled this week. 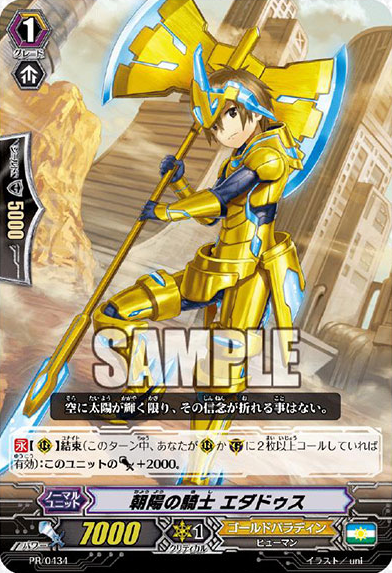 Before I go into the G-BT07 Gold Paladins, there is one promo Gold Paladin to show. 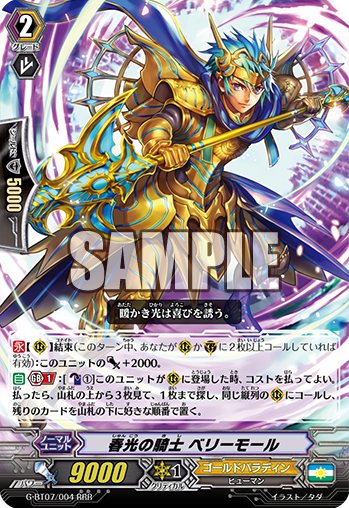 Knight of Morning Day, Edadus is a Grade 1 who gains +2000 power when he is United. He is actually surprisingly useful as he doesn’t need to attack for the +2000, so he is a possible 9k booster. Along with Knight of New Sun, Catillus you can make a 21k column. Not only that, but unlike Catillus, Edadus does not have GB1 so you could rush your opponent early game and get in some extra damage. 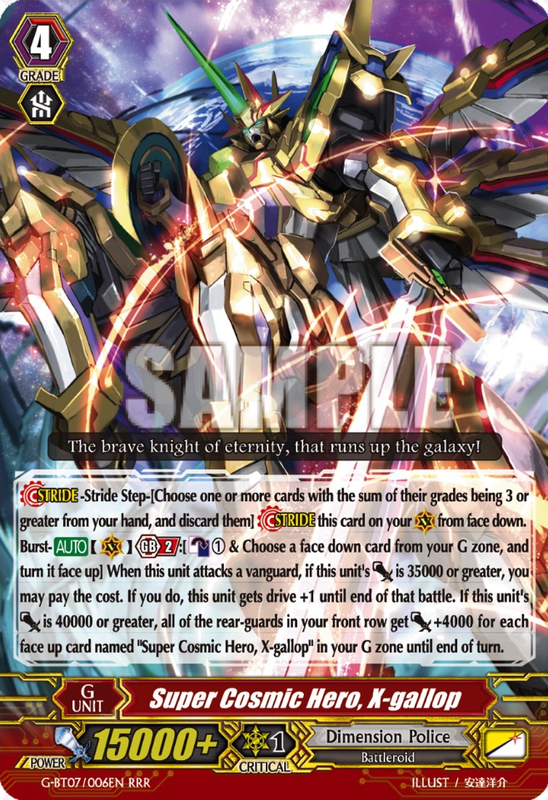 One of the new G-BT07 Gold Paladins is Dawngal, a pretty interesting Grade 3. He only has 10000 power but when he’s placed on rear-guard circle he gains the ability to boost until the end of that turn. This would work well for cards like Wolf Fang Liberator, Garmore who has the potential to call five units from the top of your deck. I’ve seen this version Garmore used a few times and the person using him usually calls more Grade 2s and Grade 3s than necessary who would usually not be able to boost, but at least you could throw Dawngal behind one of the Grade 2s now, and if you have an 11k Grade 3 or 2 in from of him then your opponent will need to start using 15k shields to block that column. Dawngal also has a GB1 Unite skill where he gains +5000 shield and intercept. Using him up like this is a good way to keep a rear-guard space free for other units and free from lock, and when against heavy retiring clans like Kagero this at least lets you retire him for a purpose that helps you. Holy Mage, Connor is another units with good defensive capabilities. 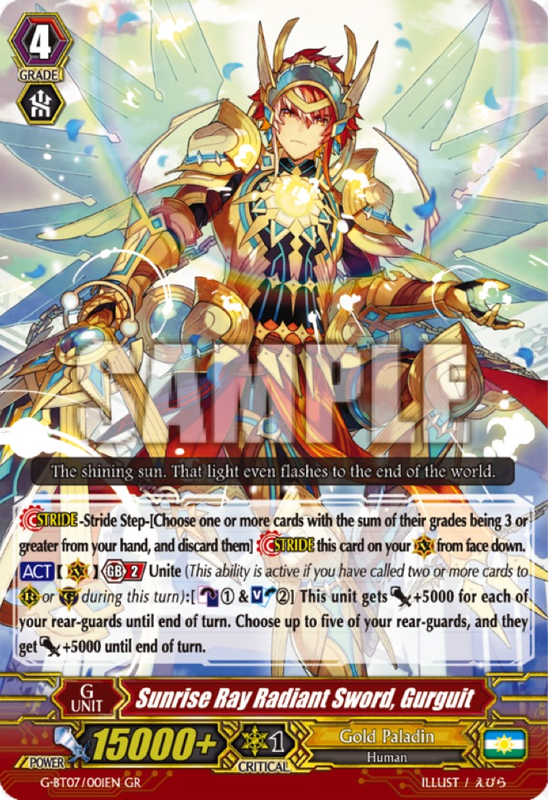 He’s a Grade 1 with 6000 power and when he is placed on the guardian circle you can Soul Blast 1 to give him +5000 shield, or when he’s placed on the rear-guard circle you can pay the same cost to give him +5000 power until the end of the turn. The blocking skill helps when using Gurguit‘s GB2 skill but the Soul Blast becomes a bit costly with Gurguit’s SB1 and CB1. So long as Golds get a lot of Soul Charging in the next set this card will be fine, but for now it can seem costly in the long run. 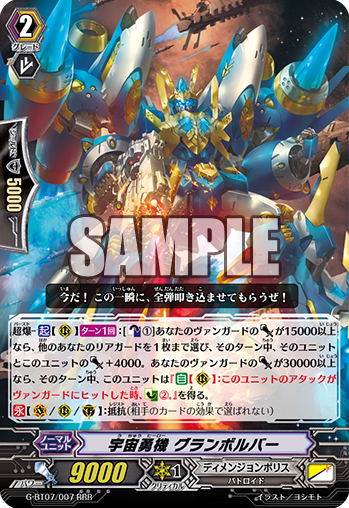 The only other Gold Paladin so far shown for G-BT07 is Scarface Lion, a Critical trigger. This unit has the usual effect of working with the G boss of the clan. When your unit with Gurguit in its name attacks, Scarface goes into the soul and you give Gurguit +5000 power and draw a card. 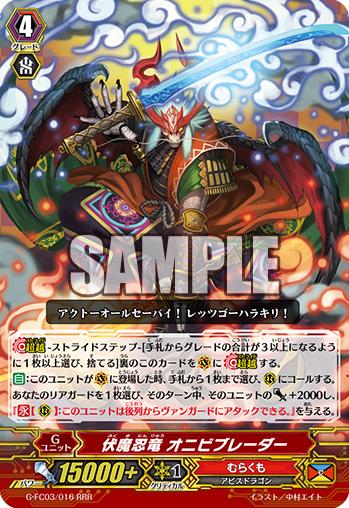 Onto the Fighter’s Collection cards we have Murakumo’s Ambush Demon Stealth Fiend, Hogen Wing. When he is placed on the guardian circle you can choose one of your Grade 1 or greater rear-guards and find another copy of it from your deck and place it on the guardian circle. Then at the end of the battle phase when the cloned card would be put into the drop zone, you put it on the bottom of your deck instead. You can use the standard perfect guards with this skill, though to do so you would need to already have a perfect guard in the rear-guard which isn’t usually advisable. 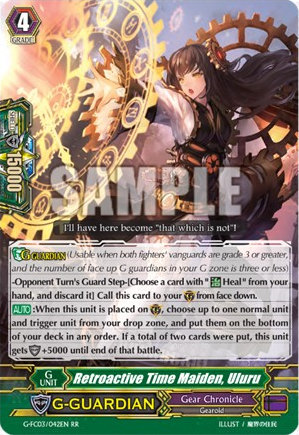 Even if you did put a perfect guard on the rear-guard circle, you could always get it back into your deck by cloning it with Yasuie‘s skill and then using Homura Raider to put all three copies into the deck. This could be foretelling the future of Murakumo’s defensive skills as we may get more units like Emissary Crow that have cloning abilities that activate on the guardian circle. Carrying on with the Japanese-theme, Jinx Stealth Hermit, Abudataishi is the G Guardian for Nubatama. If your opponent has six or less cards in their hand then Abudataishi gains +5000 shield. This kind of condition is not hard to achieve with Nubatama if using cards like Shiranui, Dreadmaster, and Gedatsurakan. Brave decks will suffer a lot against this unit unless they get a lot of end-of-turn drawing in the future. 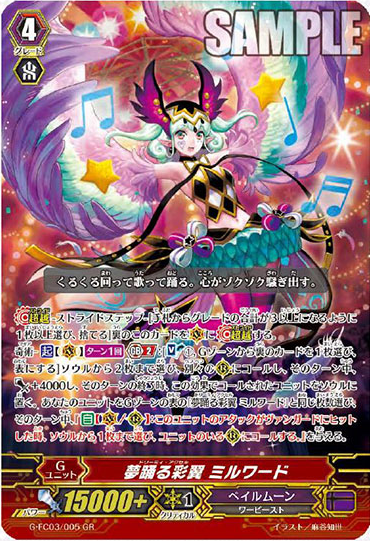 Goddess of Seven Colors, Iris is the G Guardian who’s skill will be a huge help to any Genesis deck. When she is placed on the GC you can choose three cards from your drop zone and put them into your soul, if you do, she gains +5000 shield. 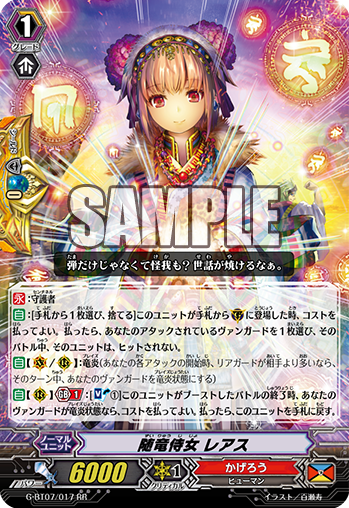 With this in a Regalia deck you can recycle Mirror Regalia, Achlis and Regalia of Fate, Norn into the soul to continue to give your opponent extra power on Soul Blast. With Witches you can guard with Witch of White Rabbits, Cardamon and Witch of Quill Pens, Oneon and still have a way to get them onto the field. Nova Grappler’s Righteous Superhuman, Blue Prison gets +5000 shield when you have more or equal damage to your opponent. It doesn’t seem very Nova Grappler-ish and I’m sure if you told someone about this ability they would think it was just some Cray Elemental, but with the new Rush keyword they definitely focus more on offence than defence. This will probably seem like an “okay” card to use in any of the older Nova Grappler decks but it’s generally an easy condition to meet so it shouldn’t cause too much of a problem. Another G Guardian that is easy to beef up to 20k is Selene Medley, Nadja, a Bermuda Triangle unit. When she hits the GC you can reveal a card from your hand and if you have a unit on your field with the same grade as the revealed card then she gets +5000 shield. Duos help a lot with this skill, especially with cards like Duo Gorgeous Lady, Kazuha, Duo Lovely Devil, Vepar, and Duo Mini Heart, Rhone who have the potential to search your deck for cards and put them into your hand. Kagero get Flame Emperor Dragon King, Asile Orb Dragon who gets his +5000 shield when your opponent has four or less rear-guards. This works great against Shadow Paladin, Tachikaze, Murakumo, Nubatama, Magia, Hollow, and many other decks, though doesn’t do so well against Kagero’s natural enemy, Royal Paladin. Lastly we have a promo for Bermuda Triangle, Wonder Frill, Nanoka. Nanoka is a Grade 2 with 9000 power and Harmony and if her attack hits and she is in Harmony then you can Counter Charge 1, and if you do you may bounce her into your hand. 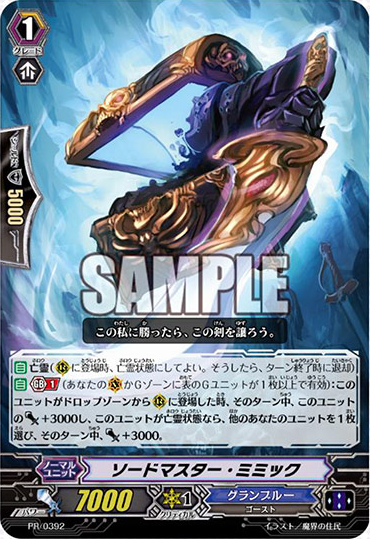 This unit would make a nice rear-guard for a Riviere deck or a Lauris deck as both Riviere and Lauris can give +10000 power to a column, giving this unit a better chance at hitting, and as Riviere has a high Counter Blast, the Counter Charge this card gives will prove especially useful. Welcome back to another weekly update of the new cards for Cardfight!! Vanguard. We have quite the variation this week with Legend Deck 2 cards, Start Deck 2 cards, G-BT07, and promo cards! The first thing we were shown for G-BT07 is the new forms of Gurguit, Gavrail, and Gallop. This makes the new Start Deck even more desirable knowing that Gurguit will be getting a new form. It will most likely be the GR of the set but luckily instead of four GRs per case, as of G-BT07 we will be getting ten GRs per case! I’m sure this is a change that many people have been waiting for and are excited about. More exciting news about this set is that a highly sought after card is finally getting the reprint she deserves. If you don’t know about Doreen the Thruster she is a card from the original BT03 and proved to be a powerful asset in any Dark Irregulars deck. With her skill of getting +3000 power until the end of turn every time something goes into the soul combined with her being a Grade 1 has allowed her to remain powerful even in new G decks. Most people who use Gilles de Rais want this card because of Gille de Rais’ skill of preventing your opponent from using a Grade 1 or higher to guard, it’s already hard enough guard a G unit in the first place. To accompany Doreen in this set we have Wings of Reincarnation, Blade Wing Reijy, another familiar face. This new form of Reijy is still a Grade 3 with two skills, his first one works from the soul and gives you the option to Counter Blast 1 and drop three cards from your hand, if you do when your Grade 3 Blade Wing Vanguard’s attack didn’t hit then you can ride Wings of Reincarnation, Blade Wing Reijy stood. His second skill would have you Soul Blast 15 when he is on the Vanguard circle if you have the original Blade Wing Reijy in the soul to give you +15000 power and +2 critical! Though it is a lot of power, it can be easily nullified with a perfect guard so it’s more of a final push, all or nothing. 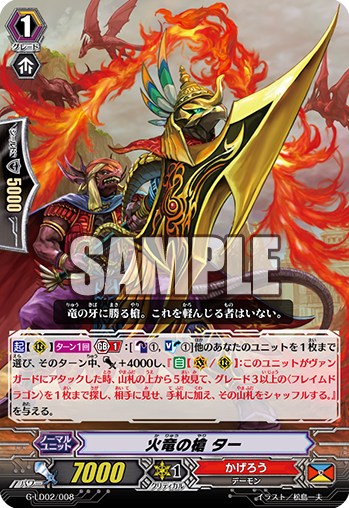 On the bright side, if everything does go wrong then your attack then you can at least use the new Blade Wing Tibold stride to put all those Soul Blast’d cards back into your deck, preventing you from decking out and getting all those triggers back into your deck. Gear Chronicle get a new useful Time Leaper Grade 2, Steam Knight, Mudal. When Mudal’s attack hits a Vanguard, if you are at GB1, you can bind Mudal to Soul Blast 1 and Time Leap another unit. He doesn’t come back at the end of the turn but as an ACT you can Soul Blast 1 to bring him onto a rear-guard circle with +2000 power. Being able to pick and choose when to bring him back out with him safe in the bind zone against most clans makes him a nice little unit to bring into your deck. You may even want to use his Soul Charge to fuel something other than himself like Steam Fighter, Mesh-he to replenish your Counter Blasts. Kimnara is back with his new form, Mighty Dragon Mage, Kimnara. First off he has the Blaze keyword that will make your Vanguard “Blazing” if at the beginning of your first attack you have more rear-guards than your opponent. Next, if your Vanguard is Blazing then at the end of the battle that Kimnara attacked you can Counter Blast 1 and put him into the soul to retire one of your opponent’s rear-guards. He can be useful thanks to the lack of Generation Break but he’s a Grade 2 with only 8k power so unfortunately he probably won’t be seen in many Kagero decks. We get a nice little Grade 1 for Angel Feathers in the next Booster. Nurse of Smash Heart only has 5000 power but each time a unit is put from the damage zone into the drop zone you may Soul Blast 1 to draw a card. With the benefit of it not having a Generation Break means even the early heal triggers can give you more benefits. In the late game, using things like Holy Seraph, Raphael and Dreamlight Unicorn will help to pull off her effect and you’ll suddenly have hardly any damage and a load of cards in your hand to defend with. Dimension Police also get some love with Cosmic Hero, Grandrifter. He is one of the Glimmer Breath clones but I feel he is one of the more useful ones of the lot. When Grandrifter is placed on a rear-guard circle, you have a Gallop Vanguard, and you are at GB1 then you may Counter Blast and Soul Blast 1 to give Grandrifter +4000 power and to give your Vanguard +4000 power with the added skill that if your Vanguard attacks with 40000 or more power then you draw a card. 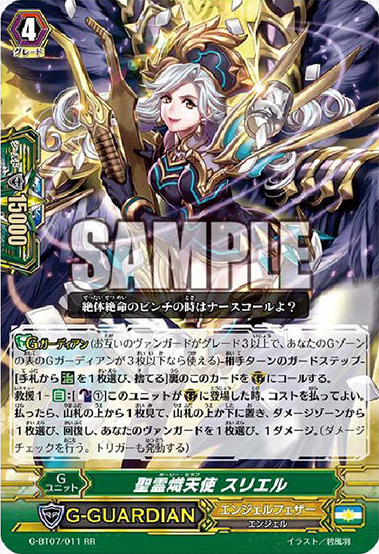 Finally for G-BT07 is the Gold Paladin, Knight of Thin Sun, Marcia. She is another 8k Grade 2 lacking in any Generation Break but she does get the Resist skill to make the 8k more worth it as well as one other ability. She has the Unite keyword that means when two or more units are placed on the rear-guard circle or guardian circle in one turn then her Unite conditions have been met and if she is United, at the end of the turn you can put her into the soul to Counter Charge 1, essentially making you get rid of her for a Soul Charge and Counter Charge. This is a nice little trick to be able to Unite your other units every turn without losing too much and she could also work well in some of the older Gold Paladin decks with her not needing to rely on Generation Break. Continuing with the Gold Paladins it’s time to go through the Start Deck 2 cards. 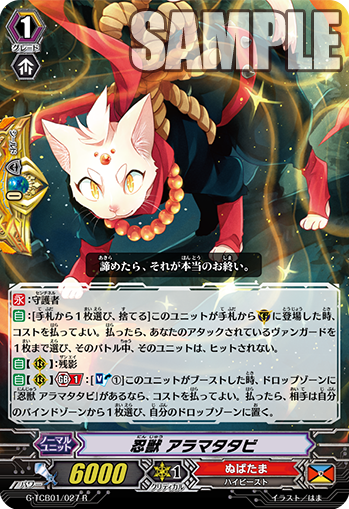 First of all is Knight of New Sun, Catillus, another Unite card. When he is United he gains +3000 power. This may seem like your usual 12k Grade 2 at first but thanks to Unite working for the guardian circle too then he can become a 12k on your opponent’s turn too, hopefully stopping your opponent from trying to kill your rear-guards. There is also a Grade 3 version of Catillus coming in this deck, Divinity Lancer Dragon, with it becoming a 14k Grade 3 on either your’s or your opponent’s turn. He will make a nice backup Grade 3 for Gurguit and even if you don’t stride you can still get some power in thanks to Lancer Dragon. Holy Mage, Elio will be the one to superior call the units from the top of the deck. When this Grade 2’s attack hits you can Counter Blast 1 and put him into the soul to look at the top three cards of your deck and put one of them onto the rear-guard circle. He is another card that can be used in early game which makes him seem a lot better and easy to use in all Gold Paladin decks. Onto the Legend Deck and we finally have the boss card shown, Dragonic Overlord “The Legend”! 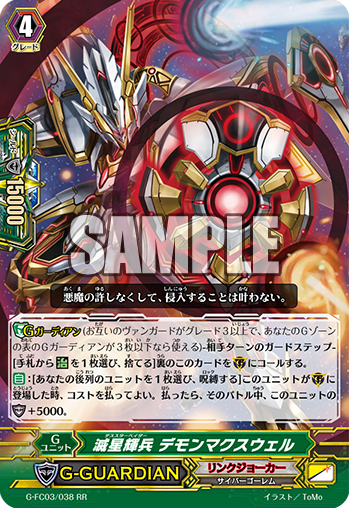 When this unit is placed on the Vanguard circle you can Soul Blast 1 and Counter Blast 1 to look at the top five cards and search for a Flame Dragon race Grade 3 to put in your hand. 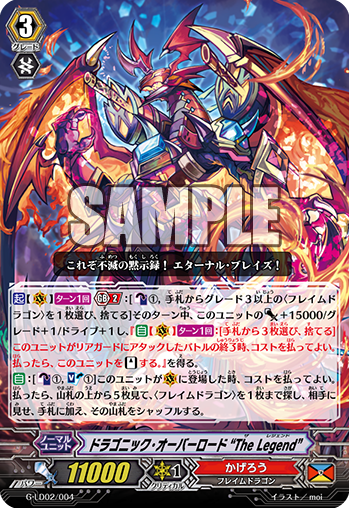 Then with a GB2, CB1, and dropping a Flame Dragon Grade 3 from your hand, Dragonic Overlord “The Legend” gains +15000 power and an extra Drive check AND once per turn, if he attacked a rear-guard, you can drop three cards from your hand and re-stand Dragonic Overlord and he keeps his new triple drive. This is a extremely strong Grade 3 and getting four of these in the Legend Deck as well as four L’Express just continues to add to the immense power of this deck. For the perfect guard of the deck we have Aermo back as clone of the PGG Nemain. When Flame of Peace, Aermo is used to guard then you may nullify the attack if you drop another card from your hand. If you have another Flame of Peace, Aermo in the drop zone then you can draw a card and drop a card. Chances are most people will still be using Protect Orb Dragon but Aermo will help you get the Flame Dragons in your hand for “The Legend”‘s skill. People have been waiting for Conroe, and yes, his new form is just as good as his old one. Lizard General, Conroe at first seems pretty standard, when he is placed on a rear-guard circle you can reveal a Grade 3 from your hand and search your deck for a card with “Overlord” in the name and put it into your hand, then drop any card from your hand. A lot of clans have had this kind of card but it works great for Overlord decks because of things like Dragonic Overlord “The X”, The End, and “The Ace” which involve dropping Dragonic Overlords from your hand and the new “The Legend” for dropping Flame Dragons. His second ability is an ACT which would have him retire himself to give your Overlord Vanguard the ability that lets you Counter Charge 2 everytime it attacks. Considering Dragonic Overlord cards tend to attack 2 – 3 times a turn this second skill basically resets your damage zone for Counter Blasts which means you can activate all your crazy abilities all over again. All that’s left of the Legend Deck are the triggers, which are all vanilla. The crit, Tenpou Master, Hakkai. A second crit, Seiten Master, Goku (That’s quite the down-grade… it’s a little embarrassing.). Kenren Master, Gojo the draw trigger. Finally Sanzou Master, Genjo the heal trigger. For Fighter’s Collection Pale Moon will have a GR stride, Dreamy Axel, Milward. With a GB2 you can Soul Blast 1 and G Blast to Magia out two units with an added 4000 power. Then choose as many of your rear-guards equal to the amount of Dreamy Axel, Milwards face-up in your G zone, and when those units’ attacks hit a Vanguard you can choose a card from your soul and call it over another card. Using Darkside Princess will add to this power boost putting her at 17000 power on her own and with her going into the soul anyway you may as well bring something out on top of her. Kagero get a RRR stride, Flame Emperor Dragon King, Iresist Dragon, who is useful as the first and potential back-up if things go wrong. When this unit’s attack hits you can Soul Blast 1 to retire one of your opponent’s rear-guards and also retire the other rear-guard sharing the column. The second part of this effect gets past resist and will give you a better chance to put your Vanguard in the Blazing state next turn. Now onto some promos, starting off with the Gear Chronicle promo, Crunching Worker. When Crunching Worker is placed on a rear-guard circle you can either have him lose one grade or gain one grade which will allow you to Time Leap him to anything from Grade 1 to Grade 3, making him an extremely flexible unit. I hear that the space for Grade 1s in Gear Chronicle is a little tight so this poor guy might struggle to see some play but I think he’s a very useful and interesting card. Next we have a couple of promos that were originally only shown in the manga. The first one is Raven Hair Ezel. He is the first of his kind with having a Break Ride-like ability but needing an Ultimate Break (Limit Break 5) to activate it, leading people to dub it Ultimate Ride or Ultimate Break Ride. When he is placed over a Grade 3 Ezel Vanguard and you have five damage then this unit gains +10000 power and your opponent cannot use Grade 1s or higher to guard. This is really a final push card but him being a Grade 3 himself will at least allow you to ride over him again and pull off the effect once more. 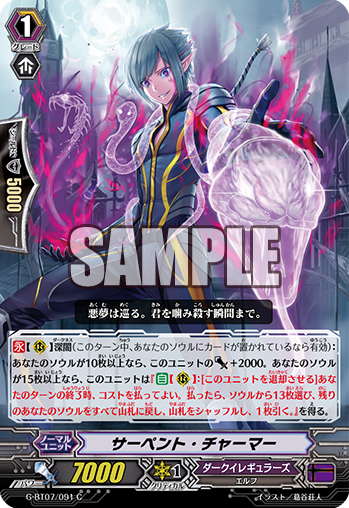 If Ezel gets a bit more support in G-BT07 then this card may see a good place in current decks. Secondly we have Excite Battle Sister, Gelato. When she is placed on the Vanguard circle you can Soul Blast 1 if you have a Battle Sister heart to look at the top cards of your deck equal to the amount of Battle Sisters you have on the field and choose one of the cards to put into your hand. Unfortunately Battle Sisters need a little bit more power before they can match the rest of Oracle Think Tank but that’s not to say that this card is bad, they just need something else to help them, maybe a big Battle Sister finisher. Welcome back to another weekly update of the new cards for Cardfight!! Vanguard. 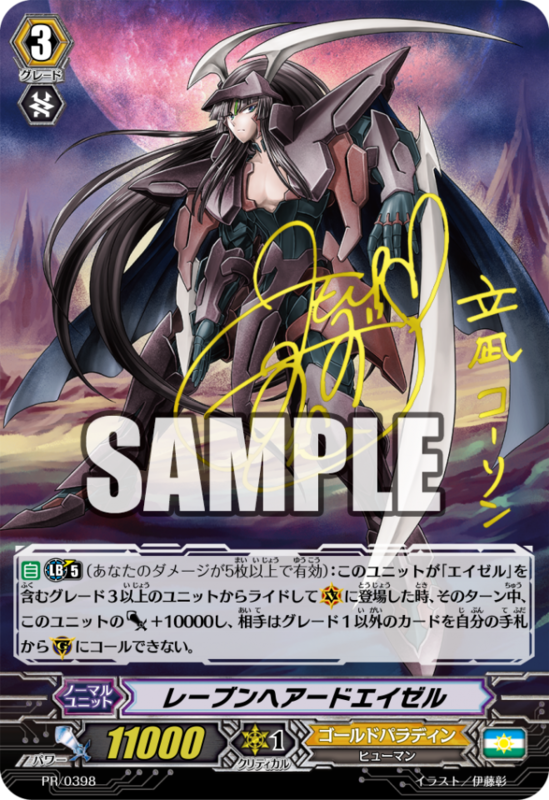 With the G-BT06 spoils out the way things have mellowed down a little and this week we have some Legend Deck cards and Fighter’s Collection 2016 cards, as well as a few promos! First of all let’s start off with some familiar faces, well, these not-so-familiar faces because they’ve become dragons, because Bushi. Tahr is one of these newly turned dragons with his new form being Spear of Flame Dragon, Tahr. 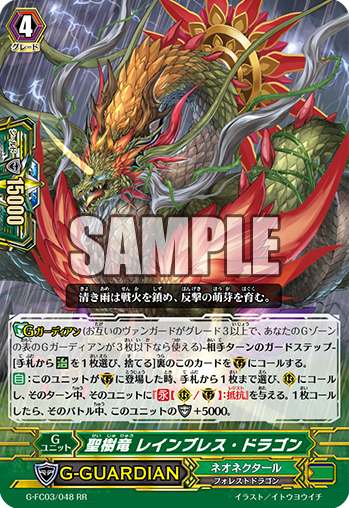 As an ACT on the rear-guard circle you can CB1 and SB1 to give another unit +4000 power and when that unit attacks a vanguard it lets you look at the top five cards from the top of your deck to search for a Grade 3 or higher Flame Dragon from among them and puts it into your hand. Also having a GB1 means you can’t rely on this card if you get Grade Locked but does help Dragonic Overlord “The X” and Supreme Heavenly Emperor Dragon, Dragonic Overlord “the Ace” drop from hand extra Dragonic Overlords to fulfill their skills. Due to you being able to search for a Grade higher than 3 you can also use this skill to have a better chance of getting Transcendence Dragon, Dragonic Nouvelle Vague though you may not be using Nouvelle Vague in a stride-heavy deck so the GB1 may cause a problem. Next we have another oldy with Armor of Flame Dragon, Bahr (The race of Bahr and Tahr is still ‘Demon’ so why are they dragons!?). 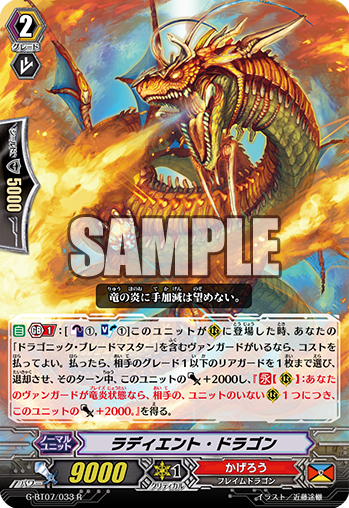 With another GB1 unit, Bahr can intercept for 15k shield with the cost of putting a Flame Dragon from your drop zone to the bottom of you deck. This is another great card to have with the previously mentioned Overlords, allowing to recycle the cards you dropped for the skill. Nouvelle Vague gets a new form, still Grade 4 but this time as a stride! 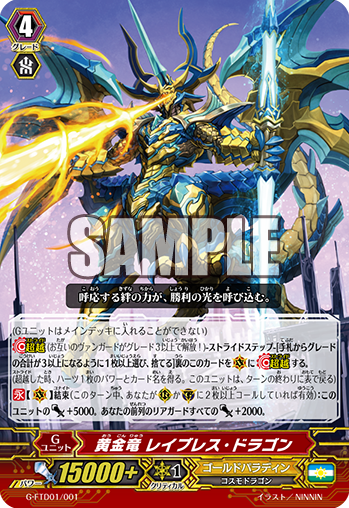 Transcendence Divine Dragon, Nouvelle Vague L’Express has a GB2, CB1, and a G Persona Unit to get the Glory skill of not allowing your opponent to guard with Grade 1s or higher, preventing your opponent from perfect guarding. The second part of the skill stops your opponent’s sixth card’s trigger from activating, eliminating all hope of getting the miracle heal. This a truly amazing card as long as you don’t value friendship. To get L’Express to even higher power to make that Glory skill more important we have Dragon Partner, Monica who is a 7000 power Grade 1 who gains 3000 power when boosting a Flame Dragon and if you are at GB1. At first this may not seem like much but it will put L’Express to 36000 power and that will make a lot of difference when your opponent can only guard with Grade 0s. So in this deck we have the teacher (Overlord), the bully (Nouvelle Vague), and of course we have to have the weird kid in the corner that no one talks about (Amber Dragon). Yes Amber Dragons are back and the new card, Amber Dragon, Midnight, lacks actual Amber Dragon support (Sorry guys), instead he will just be used as a supporting Grade 3. With a GB1 and CB1 when Midnight is placed on a rear-guard circle you can retire a Grade 1 or less your opponent controls. This is a little underwhelming and will most likely be replaced by one of the Overlords but it’s a nice little backup for budget decks. Now on to Fighter’s Collection with so Mega love… I mean Colony love… not sure which one sounds worse… Anyway! 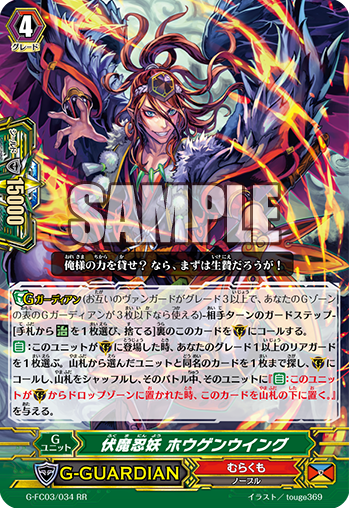 Wild Strike Mutant Deity, Struggle Dipper is a great new Megacolony stride who gives three of your units +1000 power for each of your opponent’s rested units with a CB1 and a G Blast. This is a nice first stride and will even give you the GB2 you need for Darkface‘s skill and with being able to put three units up by +6000 power turns your units into nice early beat sticks. Still not quite Regalie’s kind of power and you have to rely more on how your opponent sets things up but it may scare your opponent into using less attacks then they can actually use. Spike Bros get an extremely useful stride with Superheavy Tank, Tiger Centurion that allows all your units to go into the Charging state with just a simple CB1! As well as putting as many as your Charge units into the Charging state as you like you can also give any units without Charge +2000 power until the end of the turn making it good in both new and old decks. Gold Paladins get a couple of new promos, a stride and a forerunner. The stride is Golden Dragon, Rising Shine Dragon (Rise ‘n’ Shine.. I see what you did there, Bushi! Get it? Because Golds have morning related names now. I’ll leave..) which gives you the option to CB1 and G Blast on-hit to look at the top three cards and put up to two of them onto the rear-guard circles. This really helps with the new Gold Paladin keyword but I’ll go into that in a minute. The G Blast makes the cost seem a bit steep for an on-hit ability like his but it will put Gurguit at his GB2 which is a really good skill so it at least helps with that. So with Knight of Early Morning, Koel we get our first glimpse at Gold’s new keyword, Unite. So Unite takes effect when two or more of your units were called to rear-guard circle or guardian circle in the same turn. When Koel is United, as an ACT and with a GB1 he can go into the soul which allows you to look at the top three cards of the deck and you put up to one of those three onto the rear-guard circle and that unit gets +2000 power. This seems like a better option to Rising Lionet but there is a chance that the extra power Lionet gives you would benefit you a lot. Lastly we have a couple more promos. The first one is Sword Master Mimic for Granblue. When Sword Master is placed on a rear-guard circle from the drop zone he gets +3000 power until the end of turn, and if he’s Hollowed then you can give another unit +3000 power. This works great with Raceruler for being able to give both side columns a nice boost all around. The second promo is the Royal Paladin, Sonicgal. This little pup has a GB1 and Brave ability. At the end of the turn, if he is Brave, then you can retire him to Counter Charge 2 and draw a card. 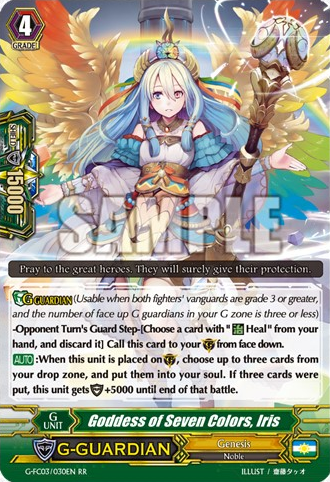 This works well for Hope Keeper seeing as she could get to be using up a lot of your Counter Blasts but I’m not sure how strict Brave deck’s Grade 1 line up will be so the usefulness of this card is hard to say at this point. That’s all for this week. I’m enjoying that the Fighter’s Collection cards are a little more flexible this time around though I do think it was also good with supporting older decks so hopefully we will see a little of both. The Kagero deck is shaping up to be something truly nasty and I can imagine that a lot of the cards in it will be very popular with tournaments and hopefully new players too. I hope there was something revealed this week that interested you and be sure to check in again next week for the next weekly update.